Your query letter is a very important element of your marketing process. But the best query letter in the world won’t help you - unless you have a solid list of magazines to pitch your stories to. I call these "distribution lists". You can also think of them as magazine lists or sales lists. 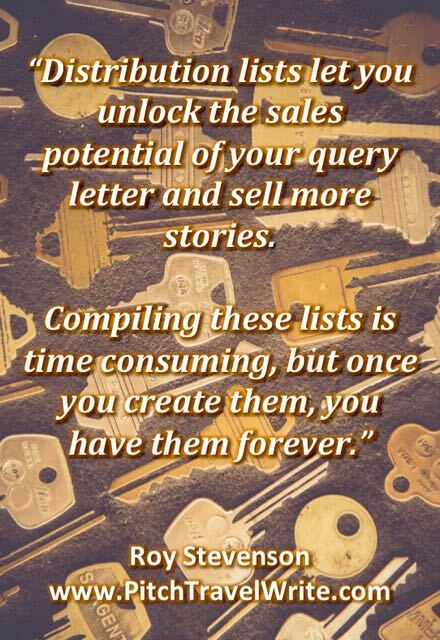 Distribution lists let you unlock the sales potential of your query letter and sell more stories. Every serious writer needs these lists - these are your potential buyers. The more potential buyers on your list, the better. I won’t try to sugar-coat it, but compiling your magazine lists is a time-consuming process. Some of your longer lists will take days, even weeks to compile. But once you create your lists, you have them forever. All you need to do is update them occasionally when an editor changes, or when you hear about new magazines to add to your lists. You might notice that I keep mentioning “lists” in the plural. That’s because I recommend that you compile several distribution lists: one for each writing genre. I have lists about travel, running, fitness and exercise, beer & wine, military, and so on. 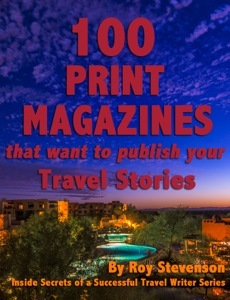 Included on these lists are magazines, newspapers, and websites in that genre. Each genre is a separate list. The idea behind a distribution list is to assemble a group of similar magazines that will be good targets for your proposed articles in a particular genre. You create a list once, then use it again and again each time you have a story idea for that genre. Distribution lists are invaluable when doing simultaneous submissions, a technique that can increase your acceptance rate significantly. Although distribution lists are time-consuming to create, it’s not a difficult process. How and where do you find magazines to pitch your story ideas? You look everywhere. There are magazines published on almost every conceivable topic you can think of, and some topics you wouldn’t, so compiling a list will not be a problem. You’ll need to use several different sources. First, visit newsstands. The magazine rack at your local bookstore is an excellent source of potential targets. Check the better-stocked magazine racks in your town. In particular, visit the specialty magazine stores, or newsagents. They tend to stock the more offbeat publications that are generally more “freelancer friendly” than the big glossies on the supermarket racks. Next, use an Internet search. The internet is a tremendous resource for tracking down magazines. It has no boundaries. It will even hunt down magazines from other countries for you. You’ll find more leads than you ever thought possible, and will soon have a sizable distribution list. Use magazine reference books, like Writer’s Market to add to your list. Include magazines from other English-speaking countries. The most prominent ones in the U.K. are Writer’s Market, Writers’ and Artist’s Yearbook, and The Writer’s Handbook. Finally, subscribe to magazine databases. These vary in quality and number of magazines listed, but you’ll find some gems in them. Some of these websites are paid by subscription only. Below you'll find a list of some magazine database websites. These are all targeted to the general freelance writing markets. If you write for a variety of genres, as I suggest that you do, then you’ll find some valuable resources to add to your lists. Also, you can read this article with links to some of the best references for magazine leads. I’ve subscribed to them all at one time or another. Spend some time surfing these websites and find two or three that seem like they’ll be a good fit for you. Then try them out and use them to help create your lists. If you want to get published on a travel website, I've published a guide with a list of fifty quality websites. Not all websites are quality websites. Many travel websites don't accept articles for publication. Some website owners prefer to write their own stories. Others are content mills. You really want to stay away from these. They're bad for your reputation. I thoroughly researched my list of fifty travel websites, and can say that you will be proud to be published on any of these fifty. You can learn more here. As you gather your information from these sources, keep track of them in a list. You can use a spreadsheet or a simple table in your word processing program. Even though you might sell some of your articles to more than one genre, it’s best to keep them separate. That way, when you have a story idea that applies to a specific genre, you don’t need to sort through hundreds of irrelevant items. Everything relevant to that genre is on a single list. I also keep track of information that I’ve gathered from correspondence with editors. When I find out a magazine doesn’t pay it’s writers, I’ll make a note of it on this list with a note to myself “doesn’t pay - do not pitch”. I don’t delete it from my list simply because I don’t want to accidentally spend time researching and pitching the same publication again. You might also make notes about whether they prefer that you submit photos with your articles, and whether or not they pay for photos. The “Notes” section can get fairly lengthy but, once again, once the information is entered, it’s there for the future. The point is, make the Notes section helpful to you when using your list to find target publications. Then all you have to do is send out your query letter to the people you’ve selected from your already prepared list. It’s true, it’s a lot of work up front to build your lists. But once you have your magazine lists, selling your articles becomes a faster and easier process. It will, ultimately, allow you to earn more with your travel writing. As promised earlier in the article, here are the details for the U.K. reference books that you can use to help build your distribution lists. The U.K. equivalent of the U.S. Writer’s Market. Lists magazines and newspapers in the U.K. and Ireland. An essential reference for freelancers wanting to be published in the U.K.